This is an anodized deep kadai with simple and comfortable to use with plastic handles fixed on sturdy stainless steel brackets. 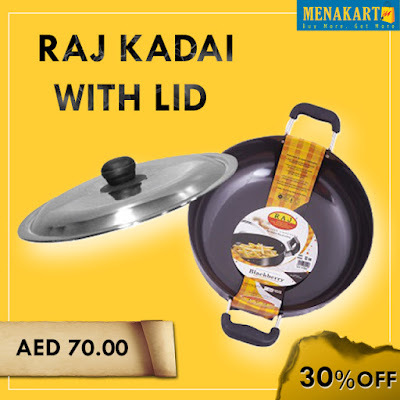 It is ideal for healthy cooking; this deep kadai provides an excellent coating surface that provides excellent nonstick cooking without the toxins or dangerous chemicals. Hard-anodized cookware is a catchall phrase for pots and pans that are made from electrochemically-hardened aluminum. Cookware made from hard-anodized aluminum has a significantly longer lifespan than traditional cookware and is virtually non-porous. It is this nearly complete lack of pores that enables it to resist sticking, even if food is overcooked or burned. Cooks generally consider hard-anodized cookware to be near the top of the line when it comes to quality standards, though there often is some variation between brands. The anodization process is basically constant across the board, but there is much to be said about the quality of aluminum that is used from the beginning, as well as the workmanship of any added coatings, handles, or lids. Shoppers usually benefit from doing a bit of research before making the investment.